Just a quick reminder that our $128 Custodes Knight upgrade set raffle, 3D printed by Shapeways, is closing soon. As at the time of writing, we're only 11 Facebook likes away from choosing our winner. Final chance to enter! 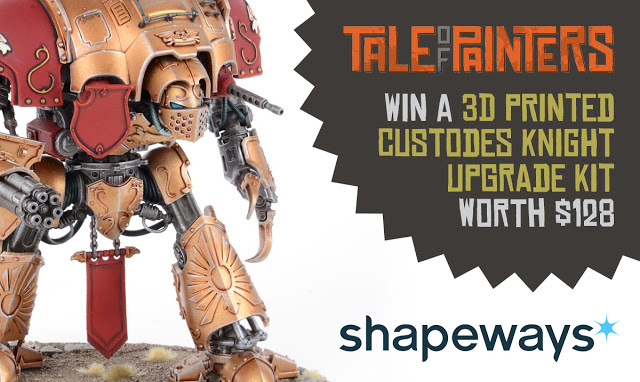 Here is what you need to do for your chance to win: Go to Shapeways' Facebook page and like it, go Tale of Painter's Facebook page and like it (if you haven't already ;), then look for the giveaway post and leave a comment. Once we reach 3,200 likes, we'll choose a random winner from one of the comments. The winner will then have a couple of days to claim his prize. Shapeways will ask for your personal details to receive your upgrade parts. Note: This raffle comprises only the mentioned upgrade parts and doesn't include an Imperial Knight kit from Games Workshop.